Gen. Philip M. Breedlove retired as the Commander, Supreme Allied Command, Europe, SHAPE, Belgium and Headquarters, U.S. European Command, Stuttgart, Germany. The General was raised in Forest Park, Ga., and was commissioned in 1977 as a distinguished graduate of Georgia Tech’s ROTC program. 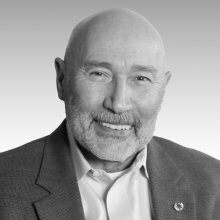 He has been assigned to numerous operational, command and staff positions, and has completed eleven overseas tours, including two remote tours. He has commanded a fighter squadron, an operations group, three fighter wings, a numbered air force, a major combatant command and an alliance. 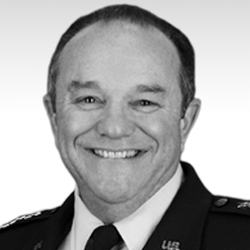 General Breedlove served in several senior staff positions to include; as Vice Chief of Staff of the U.S. Air Force, Washington, D.C. the Senior Military Assistant to the Secretary of the Air Force; and as Vice Director for Strategic Plans and Policy on the Joint Staff. Prior to assuming his position as SACEUR, General Breedlove served as the Commander, U.S. Air Forces in Europe; Commander, U.S. Air Forces Africa; Commander, Air Component Command, Ramstein; and Director, Joint Air Power Competence Centre, Kalkar, Germany. He was responsible for Air Forces activities, conducted through 3rd Air Force, in an area of operations covering more than 19 million square miles. This area included 105 countries in Europe, Africa, Asia and the Middle East, and the Arctic and Atlantic oceans. As Vice Chief, he presided over the Air Staff and served as a member of the Joint Chiefs of Staff Requirements Oversight Council and Deputy Advisory Working Group. He assisted the Chief of Staff with organizing, training, and equipping of 680,000 active-duty, Guard, Reserve and civilian forces serving in the United States and overseas. General Breedlove is a command pilot with 3,500 flying hours, primarily in the F-16 and has flown combat missions in Operation Joint Forge/Joint Guardian.